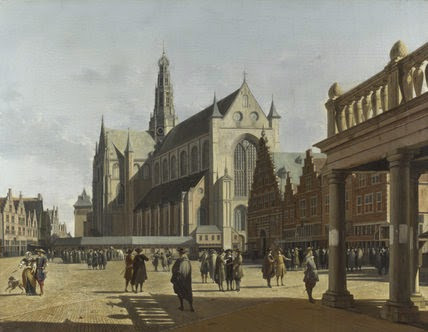 The Market Place and the Grote Kerk at Haarlem, painting by Gerrit Adriaensz Berckheyde (1638-1698). Most of the Dutch townscape painters have tried their hand at capturing Haarlem, the bustling commercial hub of the Golden Age. This page collects 20 views by 12 different artists and allows comparison to current street views of each of these sites.